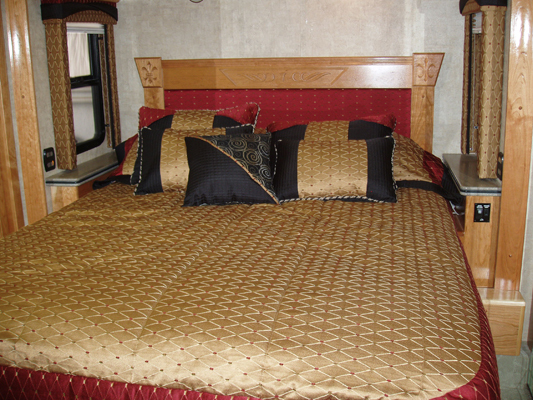 Can't find the coach or RV of your dreams? Are you disappointed that even the big-bucks new models don't offer more room, but still leave you longing for some of their custom advantages? Come to Greg Fulton's Woodwork and RV Outfitters in Bend, Oregon, to find the most economical and satisfying avenue to a truly custom upgrade that adds all the features seen in newer models at affordable prices. Do you just need to utilize space better or are you ready to add some features from those new models to overlay on a plan to provide space for hobbies? Dissatisfaction can happen. Without couples being aware of how RV Outfitters can add components and how Greg Fulton will build seamless custom cabinetry, couples can be thinking to sell their rig or trade it up. When I asked a wife what she would like changed, she quickly gave me a laundry list of changes she'd like. They hadn't tired of the adventure of travel; they were tired of making do with a seemingly wonderful interior that didn't offer any place for him to do his wood carving or for her to quilt. Then, there were the complaints about the flooring being difficult to keep up, the lack of sufficient counter space and cabinet organizers. And, when they had bought their coach, stone counters weren't available nor was tile flooring available for the floors. She had seen new kitchens but hadn't realized their kitchen could be remodeled to add all they needed to cook together. She was tired of the cloth sofa and wanting leather. She knew he needed drawers and bookshelves, and the idea of new built-ins and window treatments, and a change in the bedroom arrangement would make their place flow like the new models. Past customers know that Jim and Greg work miracles. Customers love to praise the beautiful woodwork that Greg Fulton installs, the space he finds, the finish and beauty of the end products. They challenge visitors to distinguish what was original and what was added. When Jim and Greg work together to install the latest electronics and cabinetry for viewing, customers know they have the best. Greg and Jim's legendary service reputations are built on the custom service they offer as well as the finished products. Too many custom builders don't possess the knowledge of coach construction. Not so with Jim and Greg. 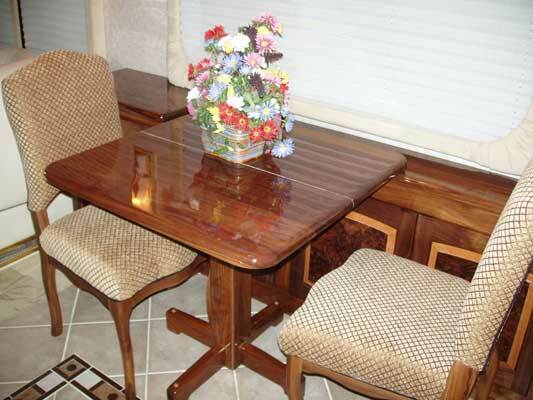 At Greg Fulton's Woodwork and RV Outfitters, projects utilize Greg and Jim's expertise that came from years of experience at the factory where coaches and motor homes were manufactured. They use this expertise to insure that everything works together; they expand the available interior space, manage to utilize the "lost" spaces that the factory can't worry with, and create better flow within the coach. If you're looking for bronze fittings to replace tiny faucets, a bathroom vanity to provide drawers, or a new look to modernize with clean lines, you can get these from remodeling. Today, for an affordable way to add the upgrades and built-in's that make an older RV become a customized, modern, timely model, visit Greg Fulton and Jim Sizemore. These are the experts to consult for your plans, and get a fixed estimate as well as a time line that RV Outfitters and Greg Fulton's Woodwork's will deliver on as promised. You are invited to "ask one of their customers!" Their white-glove service pleases everyone. If you have comments or questions, let us know by clicking Contact Us. Thank you for visiting and be sure to check back often for updated information. Customer Testimonial"They have great attention to detail and no request is out of the ordinary for them. They are fun to work with and are a great bunch of guys."